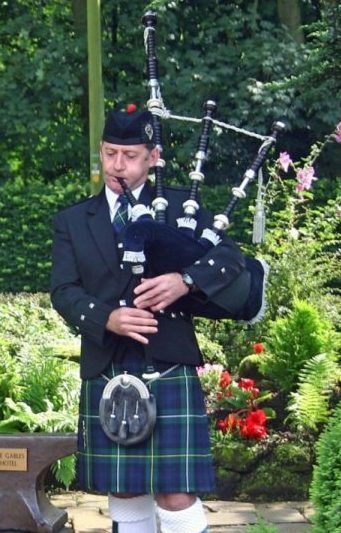 John has played the Bagpipes for 15 years, 5 years in a competing pipe band that achieved 3 Major Championship wins. 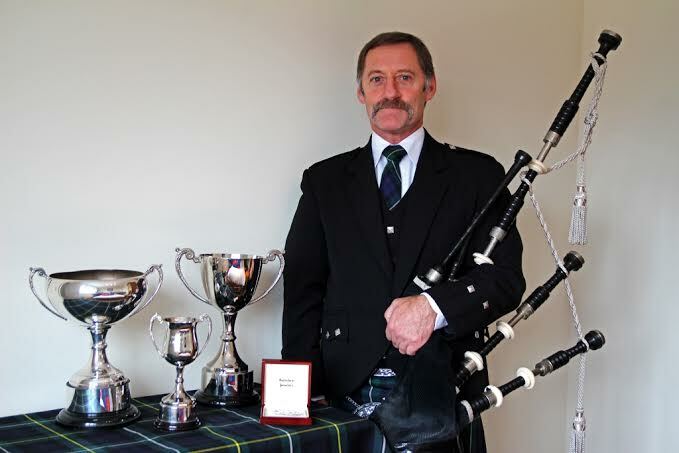 John Competes in the Competition League for Amatuer Solo Pipers’ (CLASP) organised by the National Piping Centre in Glasgow. The following are John’s most recent results. Grade 2 – 2014/2015 CLASP League Season: 4th Overall. (Light Music 3rd & Piobaireachd 5th). Grade 2 – June 2015, Edinburgh: 1st - 2/4 March, 1st - Strathspey & Reel, 3rd - Jig & 4th - Piobaireachd. Overall Grade 2 Winner. At the end of the 2011-2012 CLASP season, John had accumulated sufficient league points to win the Overall Grade 3 league title and a CLASP medal. This led to promotion to Grade 2. During the 2011-2012 season John also won all the events in a new online competition based in the USA at his grade. 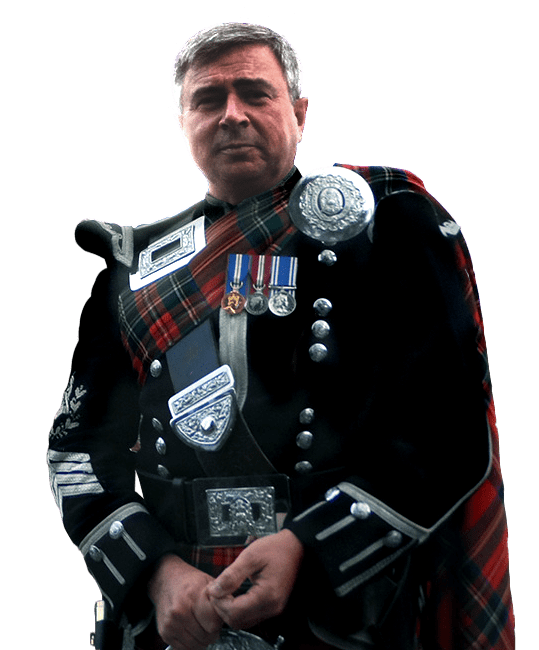 The first CLASP competition of the season in August is also the “World Amateur Solo Piping Championships”, in 2009 John came 1st at his grade. John enjoys performing at his best for audiences and would relish the opportunity to add a musical touch to your special occasion. I have received many positive comments, a selection of which can be viewed here. He lives near Cardiff, but is prepared to travel across South Wales and adjacent counties. 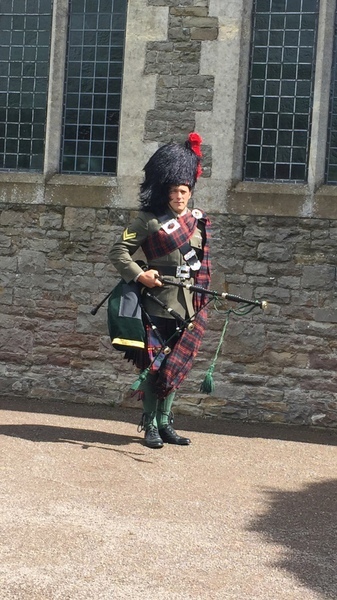 His kilt design is ‘Campbell of Argyll (Modern)’ reflecting his late father’s Scottish background. He however, was born in Wales. Hello John I just want to thank you very much for playing at my Mum's service this morning - especially in such horrible weather conditions. 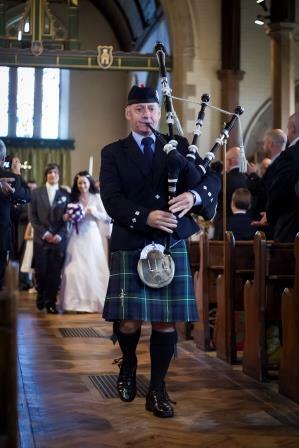 I have always loved the pipes- and you added that special Scottish touch. Mum was a very special person she loved all kinds of music and your music really made a difference in lifting the atmosphere. There is always a slight worry when you book entertainment without first-hand experience that you may be disappointed. With John I shouldn’t have been worried, professional from start to finish John is guaranteed to turn a good night into an exceptional one. I have no hesitation in recommending John as a professional that will go that extra mile to ensure your event is a success. 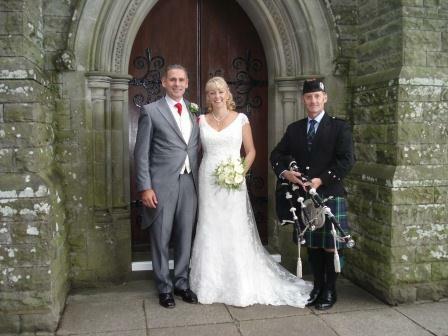 We had the pleasure of having John play his pipes at our wedding he agreed to play at very short notice and made our special day a bit more special he helped with the choice of tunes and was very accommodating, John and his wife were brilliant even helped me tie my tie properly and secure my flower I would recommend anybody who wants to add something special to their day to consider John and his pipes absolutely amazing and really captured the atmosphere we wanted,we had many great comments about John and his pipes he is a true master of his art.. It has been an honour meeting John. He played for us at our wedding, welcoming us and our guests in and out of the venue. 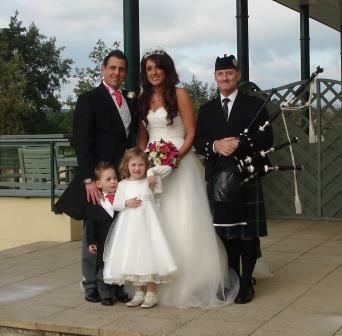 The sound of the bagpipes and the choice of Welsh songs was truly inspiring and set the scene for our big day. He is so professional and such a lovely man , nothing was too much trouble...a true gent !! He kindly agreed to pose with us for photographs which we will cherish forever. We highly recommend him. Thank you John for making our day so special and so memorable. Superb ! We hired John for our wedding in July 2015. Was the best thing we ever did. John was excellent, a wonderful addition to our day. 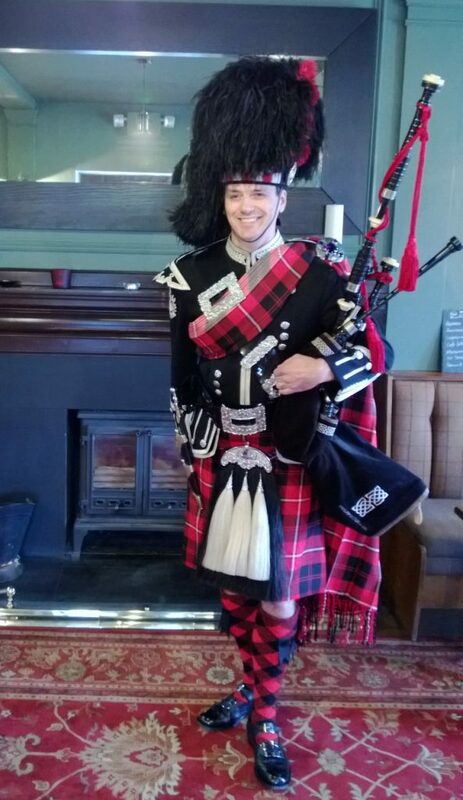 I'm Scottish and wanted to have a good mixture of Scottish and Welsh. John's knowledge, talent and professionalism is excellent and would recommend him to anyone. He was great from start to finish - not just on the day but beforehand, advising about song choices and order etc. Thank you John for making our day so special. Nigel and Nicola. John played at our wedding at the end of April. He was absolutely fantastic throughout the whole day and played for longer than we originally asked without complaint. John played at our wedding in May 2015. I am from Scotland and so wanted to have a good Scottish flavour to the proceedings. 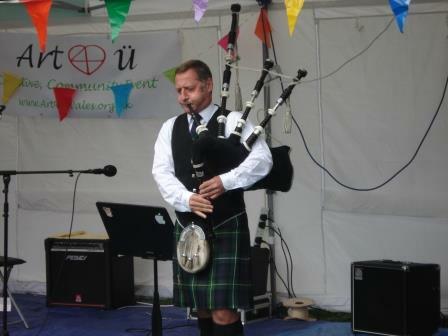 The fact that he can play Welsh tunes as well meant that we could have a great Scottish and Welsh mixture. He was thorough in helping us plan what we wanted in terms of his involvement and was a pleasure to work with. He was one of the stars of the day! Thank you John. You made our wedding even more special pam had no idea you were going to be there it was lovely that you took the time and patience with us and the many photographs that were taken I would recommend you to anyone. Thank you again. We had John at our Wedding and from the moment we booked him he was first class. John was always there if you had any questions and also provided us with his wealth of knowledge. All our guests loved John and the music he provided was spot on, he ensured the music was relevant to the audience. John also had photos taken with us and various guests and was an excellent choice for our Wedding. We even had him pipe us into the Wedding breakfast which was an honour. I can't thank John enough, there are not enough stars above to match the level of service he gave us. John is such a talented musician whom I can highly recommend. Thank you for making our a wedding so special and bring part of our day. From the minute we first contacted John, he was utterly professional and always on hand to help, advising the correct way to bring in a Haggis etc. He couldn't have been easier to work with and his playing of the pipes was outstanding. 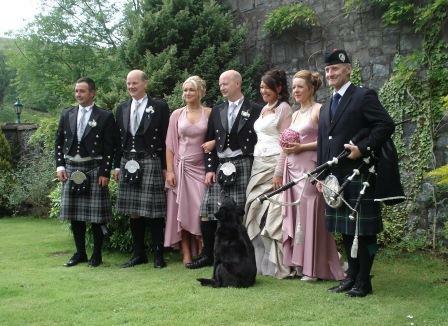 Both us and the client could not have been happier and would happily recommend John to anyone looking for a true Scottish piper. Vicki Watson, Keystone Events. John recently played at the funeral of a close friend. He agreed at short notice, and the day before the funeral he took the trouble to visit the cemetery and check the route - very professional. His recommendations of suitable pieces were excellent, and his playing on the day was beautiful. Thank you John from all those who attended.